The Fédération Equestre Internationale Tribunal has issued its final decision on the case against Irish show jumping athlete Kevin Thornton for alleged abuse of the horse Flogas Sunset Cruise, which died at Cagnes-sur-Mer (France) on Oct. 10, 2016. The FEI officially opened a case against Thornton last November. 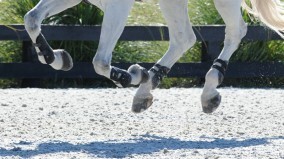 The FEI Tribunal found the athlete guilty of horse abuse and has suspended him for four months from the date of the decision (June 6), and imposed a fine of $5,179 and costs of $5,179. Flogas Sunset was a 10-year-old Irish Sport Horse (ARD VDL Douglas—PH Cruise Hill, Cruising), owned by the rider and Vinnie Duffy. Thornton said he’s decided not to pursue an appeal due to the cost and time it would take to work his case through the system. “I would love to appeal it, but financially the whole process has really cost me so much money, just to protect myself. It’s bad enough that I lost the horse as well. For me, if I go to the Court of Arbitration for Sport it’s going to take a few months and a lot of money and a lot of stress. At the same time, four months will be up. In the end, I’m fighting a battle I can’t win. From the beginning, I was fighting something that I couldn’t win,” he said. The 28-year-old rider said he was “disappointed” in the decision because he feels there was no physical evidence from the autopsy that the horse was abused. “The autopsy was inconclusive. There were no signs of any sweat on the horse, there were no marks from the stick or spurs or anything,” he said. Flogas Sunset Cruise’s autopsy showed he had the “presence of about 10 locally spreading, dark red marks in the muscles of the right shoulder: moderate, recent muscular hemorrhage,” but no welts on his skin that would indicate excessive use of the whip, and vets who studied the autopsy could not say whether or not the red marks in the muscles of the shoulder were caused by excessive use of the whip. Thornton provided two witness statements describing the incident, and six others provided witness statements alleging what they saw was abuse. “The witness statements were not so consistent. They all said that I hit the horse, but inconsistently—how many times I hit the horse and where and how. They were all influenced by the media and the show at the very beginning, so from Day 1, everyone’s already had their minds made up before anybody knew the situation. It’s difficult to accept,” Thornton said. Thornton added that he respects the FEI for their commitment to protect the welfare of horses and for investigating potential horse abuse cases, but believes he was being made an example. The decision can be appealed before the Court of Arbitration for Sport within 21 days from the date of notification. Thornton, who is based in Peer, Belgium, said he’ll serve his suspension and is anxious to get back to competing again. “All of my owners support me fully, and I contacted them all straight away. For them it’s no problem. I have horses in my stable, and my own horses will continue to work until the four months is up, and I’m ready to go back and compete again,” he said. The full text of the FEI Tribunal’s final decision on the case can be viewed here.